I did some more work on this. Added a bit more colors for one of the directions. I know it's not perfect but I believe the extra effort I put into it is worthwhile. Also tried out Aseprite on this update. 2D & 3D / [WIP] "Revenge of the Love Bot Deluxe"
I have many things I want to change with this picture, but first I'd like to hear some thoughts. I get what you're saying with the outline color. I could probably turn it down even more. I'll experiment some more with that. I hope this is better than before. I intend to add more polish to the animation before adding in more colors. Also, I changed the color inside the cloak because she was starting to look like Batman. I made another update to this. I tried to take your advice into account. Made three versions and stuck with the best one. The game is quite orthographic in nature but I like to have a little perspective. First two (top) are very similar to the pixel version. I try to explain the "top down" perspective. What I really mean is that it's viewed from a superior angle or 45 degree top/frontal. I added a man too for reference. Next two (middle) I tried to rearrange some of the body parts. I made the legs too small in the first one and the minotaur very tall in the second. Again a man for size reference. I actually like the second one although it's much taller than I intended. Last four (bottom) are the original pose as seen from different angles. I guess I can begin to see how this is helping me grasp the anatomy of the pose. I'll keep the other stuff in mind as well when I get back to pixeling. This is one of many characters I'm working on. It's a lot of work but it's paying off in the end seeing the character do it's moves in game. I have to apologize for the lack of progress on the last animation. It's mainly to show what direction I'm taking it in. Think of her as a witch chased by an angry mob. Would love some comments on the character itself, palette, and of course the animations. Trying to pixel a minotaur for a project of mine. I'm having a bit of problems with this one. In particular it's super messy and inconsistent. I tried making some veins and chest hair plus I'm experimenting with specular lighting. Light is supposed to be top down. As is perspective. LoL please help me out. A few years ago (~2005) I got the idea to make a RPG. So I drew a character outline and figured I'd base characters out of that. 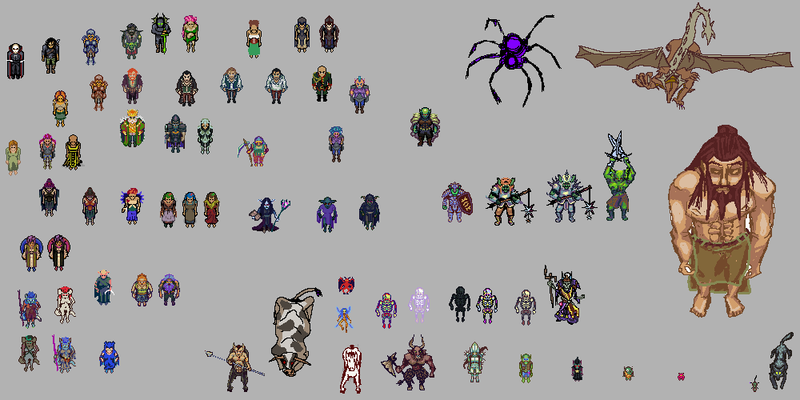 Top down sprites has never been my specialty but I figured I'd post this outcome of a decades worth of programmer graphics. Some are more awful than others. I'm hoping for critique nevertheless. Up angle is fine except maybe I think the lighting on the legs as they go back are too high. To my taste. I think side way angles are too exaggerated maybe. Makes him stand out much like a marching soldier. Steps doesn't need to be so big. Looking forward to see his run.